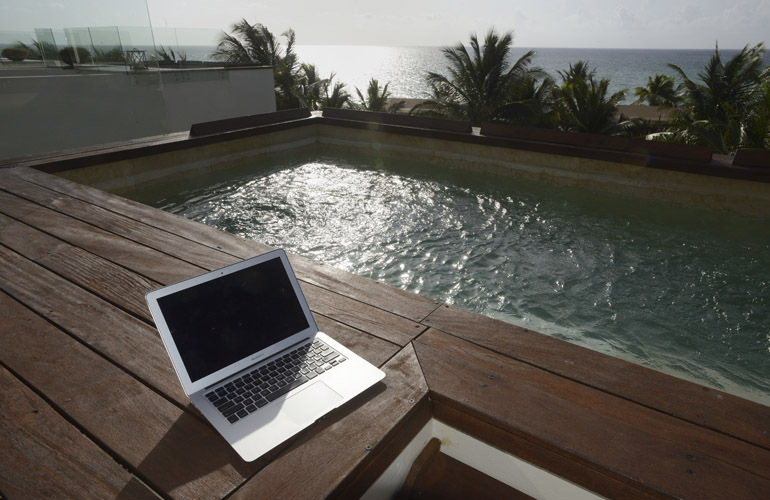 When I need to stay plugged in on a beach, I head to Rosewood Mayakoba, on Mexico’s Riviera Maya. We’d all like to spend our vacations blissfully unplugged, but the reality is that most of us can’t. TripAdvisor’s just-released Working on Vacation Survey found that 77% of U.S. respondents have worked on vacation in the past year, with 91% checking email and 42% creating and editing documents while on vacation. I’m one of that overworked group, and that’s why I’m forever on the look-out for that holy grail of the 21st century: An exotic yet close-to-home escape where I can accomplish two conflicting goals—work and vacation—simultaneously. When every second with your loved ones counts, you want a resort that enables you to be so efficient that your work cuts into your precious bonding time as little as possible. And, so that you don’t resent being tied to email, you need a desk with a view and a beach with Wi-Fi. That’s why I chose Rosewood Mayakoba—on Mexico’s Riviera Maya, a 40-minute drive from the Cancun airport—for my family vacation this summer. 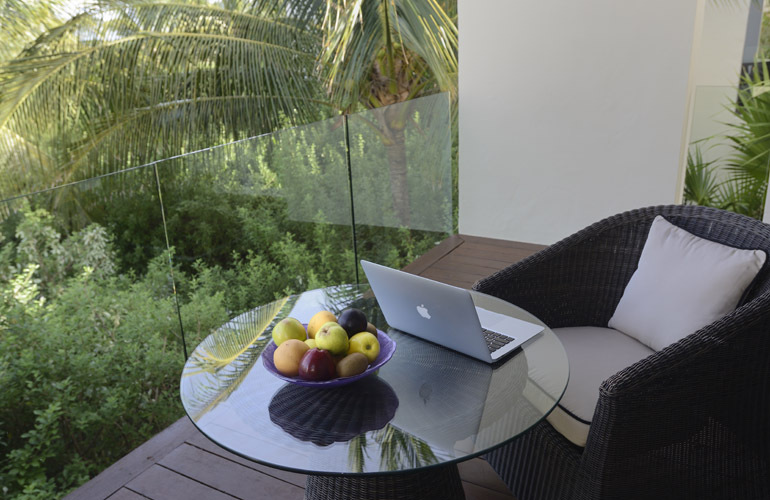 We just got back and, in fact, this was my third trip to Rosewood Mayakoba. I’d gone twice alone on business for Condé Nast Traveler—see My New Favorite Tropical Beach Resort and 7 Special Touches That Every Hotel Should Have—and each time I could tell that the resort would fit my family’s needs perfectly. I finally made it back with Tim and the kids, and I was right: The combination of tropical jungle setting, wildlife, water sports, and a complimentary supervised kids’ club–all just a four-hour non-stop flight from home—meant that they could get a vacation they loved while I got what I needed as well. 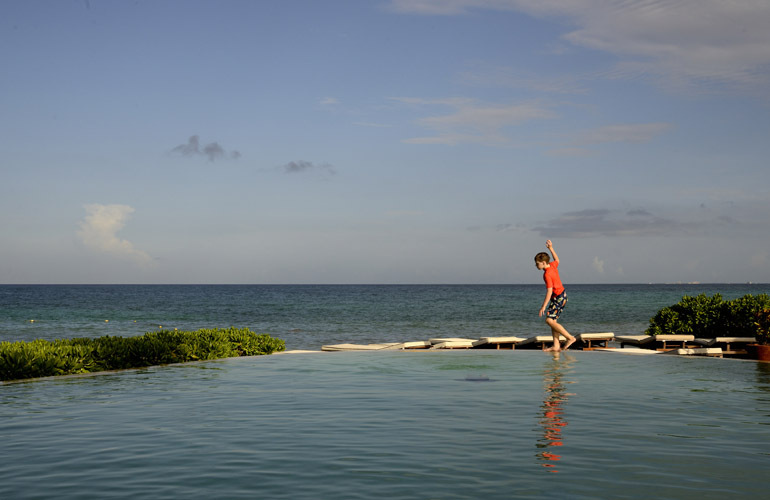 My 10-year-old playing (while I was working) at one of Rosewood Mayakoba’s three pools. * You’ll find free, fast Wi-Fi on the beach, at the pool, and everywhere else. Deadlines go down better with fruity cocktails. * There’s even Wi-Fi in the car that picks you up at the airport. * When you’re too busy to leave your room, you can still enjoy a pool. Each room is a freestanding suite-style bungalow that comes with a private plunge pool. Need a quiet space for a conference call? You can seal yourself off from noisy kids by closing the door to the living room or bedroom, or you can move to your terrace or even your plunge pool. * You get a desk with a view. Should you opt for working in the air-conditioned indoors, the only thing separating you from a water-and-palms view is floor-to-ceiling glass. * There’s a never-ending supply of complimentary coffee and fruit to sustain you. Every room comes with a bowl of fruit that is replenished daily. Each room has a Nespresso machine too—and unlimited complimentary bottles of water. 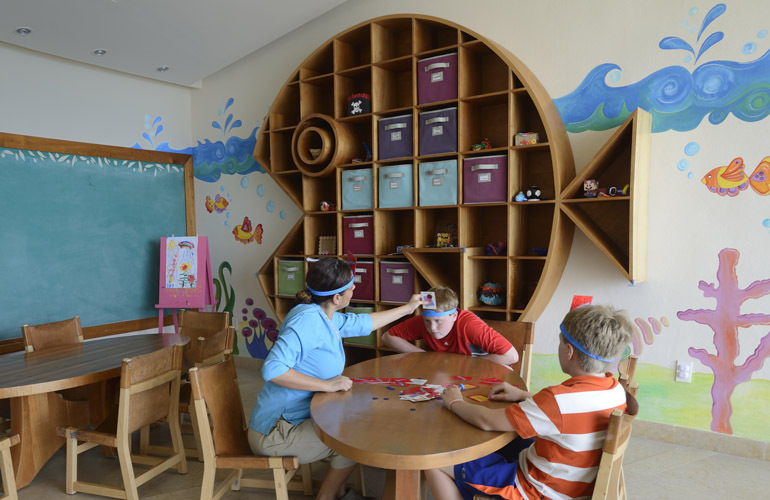 * The supervised kids’ club is free and open every day from 9 to 5. My boys loved the counselors in the Rose Buds kids’ club. Yes, there’s someone to watch your kids so your spouse can get a well-deserved break. My boys are now 10 and 12 and, even though the Rose Buds children’s program is used mainly by younger children, they enjoyed it enough to spend quite a bit of time with the group, taking ecotours in the lagoon, painting ceramics in the clubhouse, etc. After signing them in to Rose Buds once—at the start of our stay—I never had to leave my desk to sign them in or out again. They could come and go as they pleased—and, of course, they were old enough to wander around the resort on their own. * Each guest gets a bike. My 12-year-old heading to breakfast. Each bungalow on the sprawling property is connected by winding “roads” designed for walking, biking, or riding in golf carts. This means you live in serene seclusion, yet there’s no long walk to wherever you need to go (e.g., the beach club, the spa, the sushi restaurant) because you can zip there by bike. Even when I had to work all day, I still got precious family time during our morning family bike rides to and from breakfast. * The resort’s app saves you time. Wherever you are on the property, you can use it to check the menus in the restaurants, order room service to be delivered at a particular time, or ask your butler (yes, butler) for help with whatever you need. Now, I’m the first to acknowledge that Rosewood Mayakoba is a splurge. The price of an entry-level “room” (again, a freestanding bungalow with a view of water and palms) ranges from $465 in low season (July–September) to $675 in high season (approx. December 15–April 15). My family went in low season—specifically, August, when the weather was surprisingly lovely (breezy, with little rain, and not much hotter or more humid than New York City). The resort was kind enough to provide complimentary accommodations to my family; I paid our airfare, meals, activities, and other expenses. In keeping with my standard practice, there was no request for or expectation of coverage on Rosewood’s part, nor was anything promised on mine. This truly is one of my favorite resorts—for either a family or a romantic couple (it works equally well for either)—which is why I’m writing about it: I want to make sure you’re in the know. As mentioned, this was my third trip to the resort, so I feel confident I can give you a fair evaluation of the experience. I have a lot more advice to share based on my trip, including why going in August is a smart idea (hint: it’s the perfect moment to swim and snorkel with whale sharks), so stay tuned, but meanwhile, if you have any questions, feel free to ask below. Argentina, Chile, Patagonia: Plan Your Trip! We just booked a week in Dec. at the Rosewood. So excited! We have two little ones, ages 1 and 4. What do you think is the best way to get around the property (to breakfast, restaurants, exploring, etc.)? They’re too young to ride a bike. You’ll see that the resort’s staff get around in golf carts and transport guests here and there in them. It’s easy to call the front desk and ask for a golf cart to pick you up in your room and take you to wherever you’d like to go. Have a great trip! 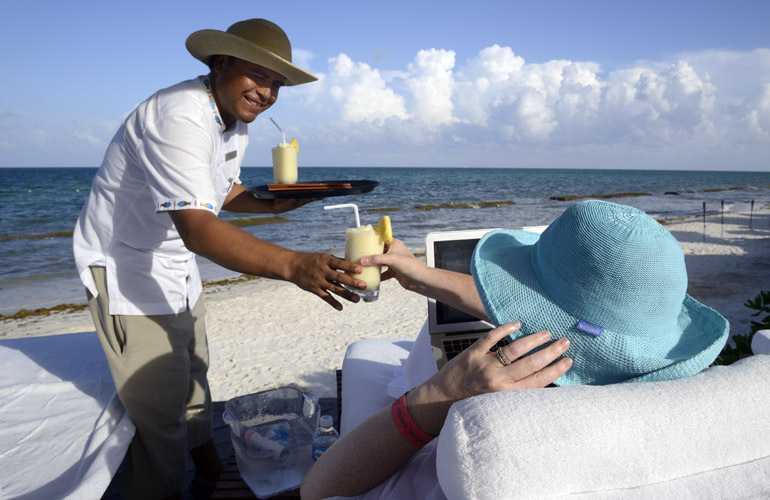 Hi Wendy, we will stay at Rosewood Mayakoba this spring break holiday. After reading your article, we really look forward our stay at Rosewood. I hope it will be a memorable experience for our daughter. By any chance, could you please recommend some activities or places we should go with 6 years old girl around the area? Did you happen to explore the southern or northern part of Mayakoba during your stay with your families? I just found out your WOW list service but I guess it’s too late to use it now since I already made a hotel arrangement for this trip. Maybe another trip :) Thanks Wendy! Hello, and thank you for your review. I just booked twelve nights in Aug for a lagoon studio for my family (two kids ages 6 & 9). I was very torn between this property (our adult experience) and the Fairmont (the kids experience). In the end, I went with my experience (LOL). Do you know if Rosewood guests are allowed to use the fairmont pools or beaches? I know that charging to room is allowed across the Mayakoba resorts, but wasn’t sure if that included poolside. Also, i read a review that mentioned the Mayakoba having kid scooters available…do you know if that is true? Hi Deanna, I’m pretty sure Rosewood guests are allowed to use the Fairmont’s facilities. The Rosewood property itself is very child-friendly==with a kids’ club, a kids’ breakfast buffet, and much more–but 12 nights is a long time, so you will indeed probably want to explore the Fairmont. I don’t recall kids’ scooters, but everybody (including kids) gets a bike. 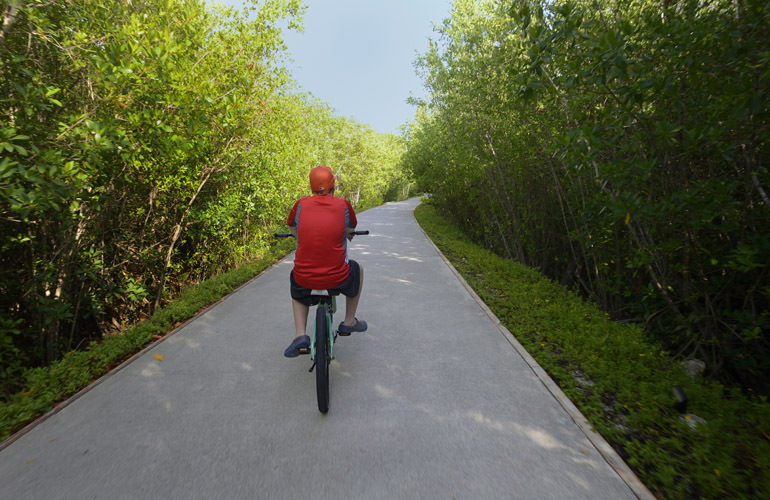 My 10-year-old and I rode bikes all over the whole Mayakoba complex, from the Rosewood to the Fairmont to the Banyan Tree. There’s a bike path that encircles the whole complex and takes you past an ancient cenote and other fun landmarks. I highly recommend it.